Marc Angeles for Coldwell BankerWelcome to the Palazzo di Amore. There is no shortage of over-the-top mansions around the country. 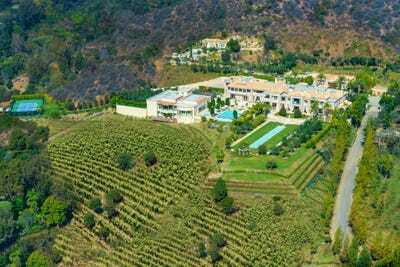 But the Beverly Hills estate of real estate mogul Jeff Greene, which just hit the market with a price tag of $US195 million — making it the new most expensive home for sale in the US — is in a league of its own. Known as the “Palazzo di Amore,” Greene’s home was built for parties. 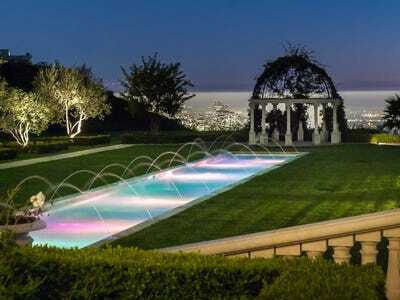 It has an entertainment complex and ballroom that can fit 250 guests, a private-label vineyard, and parking garages for more than two dozen cars. Greene, who made a fortune when the real estate bubble burst, is worth some $US2.2 billion. 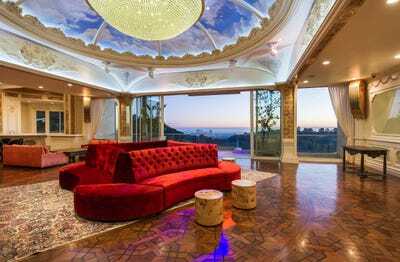 With its $US195 million listing price, his home is by far the most expensive on the market, beating a Florida home currently listed at $US139 million. 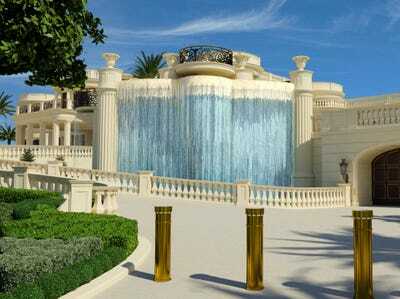 The Palazzo di Amore is not your ordinary mansion. It's a true party palace, with space to entertain 1,000 guests. Visitors pass through three sets of gates before arriving at the grand home. The two-story entry has a pair of curved marble staircases. 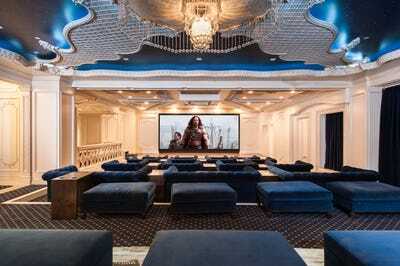 The 15,000-square-foot 'entertainment complex' is what sets this home apart. It has a ballroom with a revolving floor and can host 250 for a seated dinner. 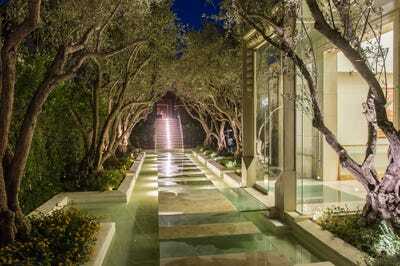 Guests enter through a floating glass-floor walkway lined with olive trees. There's a screening room that seats 50, as well as a bowling alley and game room. Did we mention that the wine cellar holds 3,000 bottles and a tasting room? 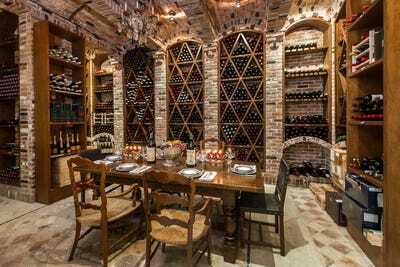 But you'll need all that storage space, since the Palazzo di Amore has its own private-label vineyard, which produces around 400 cases a year. Conveniently for your guests, the property has parking for 150 cars, as well as garages for 27. Of course, it's not all fun and games. Get lost in thought by the 128-foot reflecting pool and fountain. Or chill out in your personal spa. Or take a swim in the spacious pool. Or play a round of tennis on your private court. 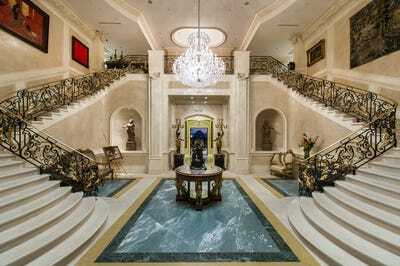 With 53,000 square feet of space, this mansion is truly gigantic. The home has 23 bathrooms and 12 bedrooms, including a 5,000-square-foot master suite. That's a small mansion in its own right. And the views are undoubtedly spectacular.